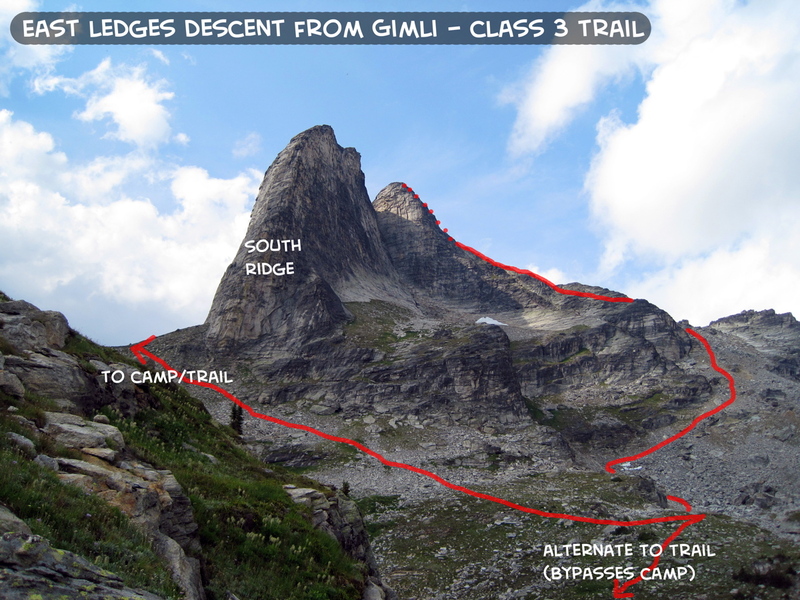 In early August, I climbed the classic South Ridge of Gimli in the little-known Valhalla Range of British Columbia (see overview below). 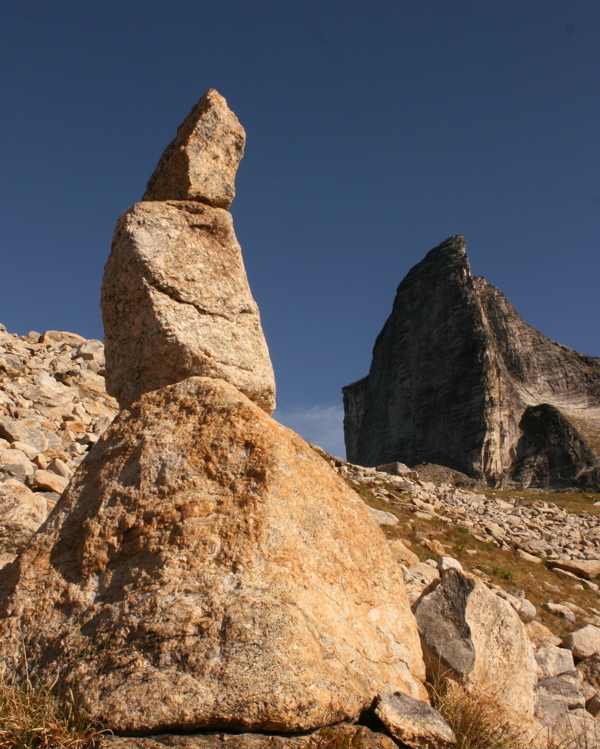 This was a great route and I was impressed with the quality of the rock and the striking formations in the range. Thundershowers prevented any more climbing on this first trip, but less than a month later, I came back to explore deeper into the range. David Kiehl, another student living in Seattle, was a great partner for this trip. 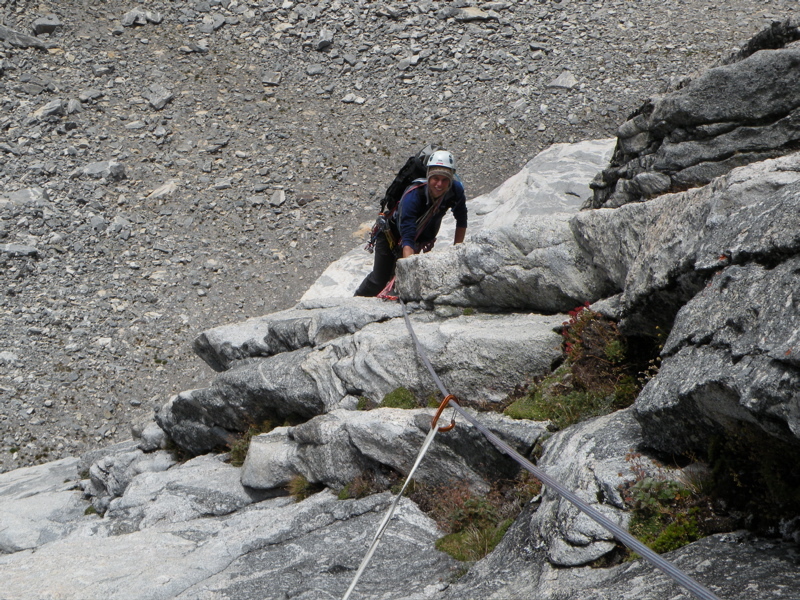 We spent 3 full days in the Valhallas, climbing 4 fun routes and enjoying the beauty of the area. 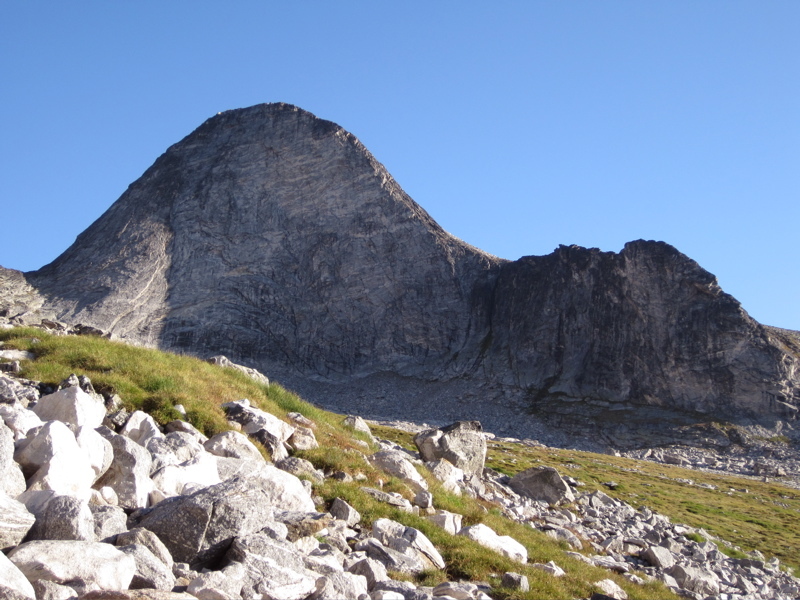 The following trip report gives photos and (limited) details of our 4 climbs in the Valhalla Range. Enjoy! 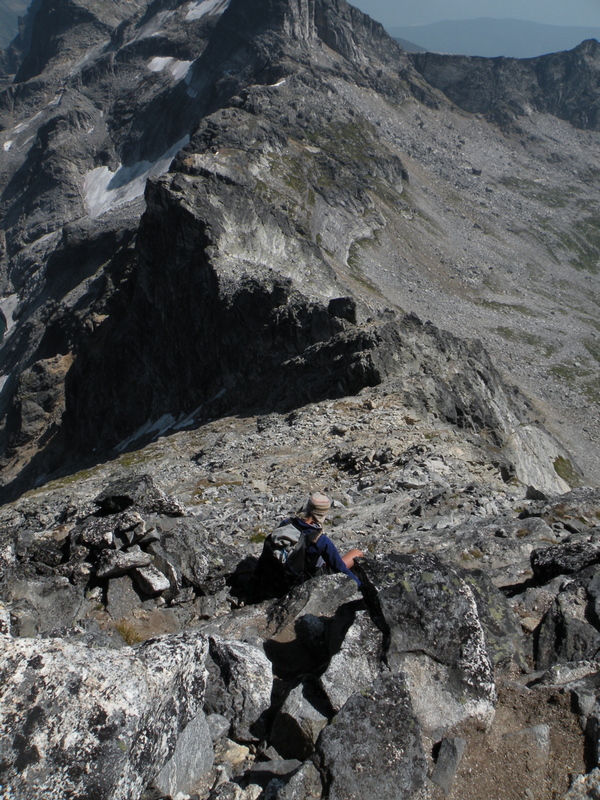 The Valhalla Range is a dramatically diverse area in the Selkirks of SW British Columbia, about 100km south of the Bugaboos. 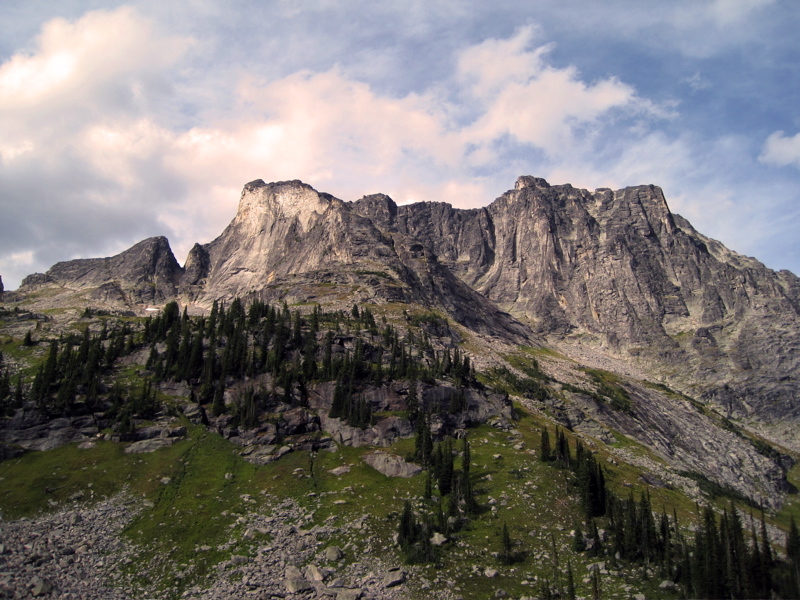 Along the southwestern boundary of Valhalla Provincial Park is an outstanding group of spires including Mount Dag, Wolf's Ears, Gimli, Asgard, and Gladsheim, all over 2,660m. 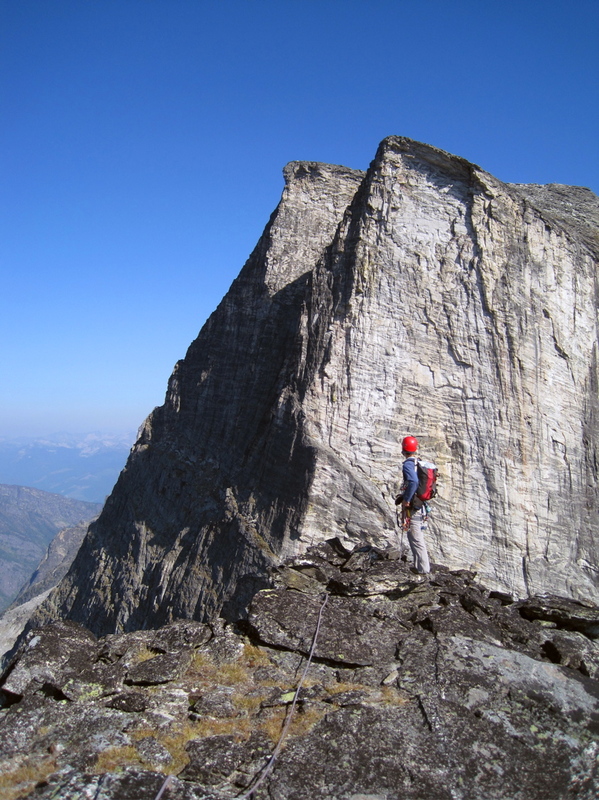 These peaks offer great climbing. The lack of published beta for these climbs is part of what makes the Valhallas unique and challenging. It is nice to find an area of great climbing where there is not a myriad of route descriptions detailing every turn on every possible climbing line. 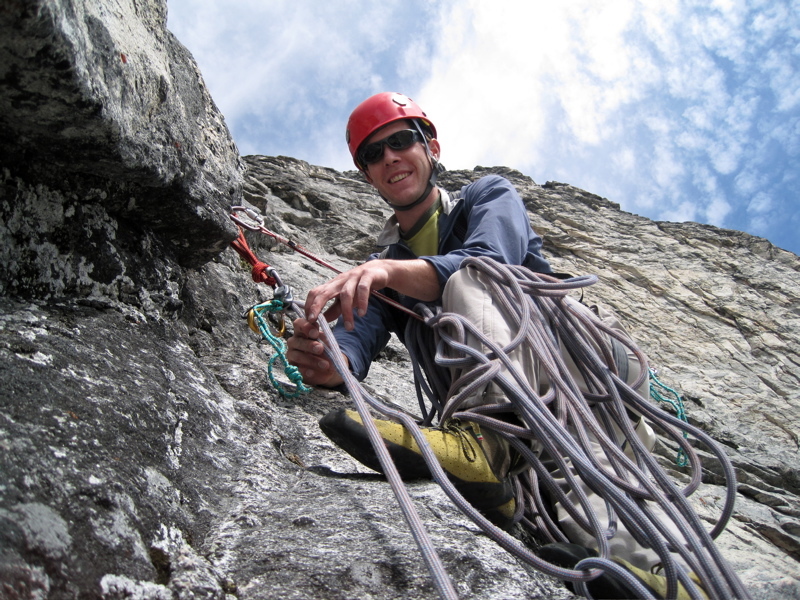 With the internet, many climbing areas are suffering from beta overload. 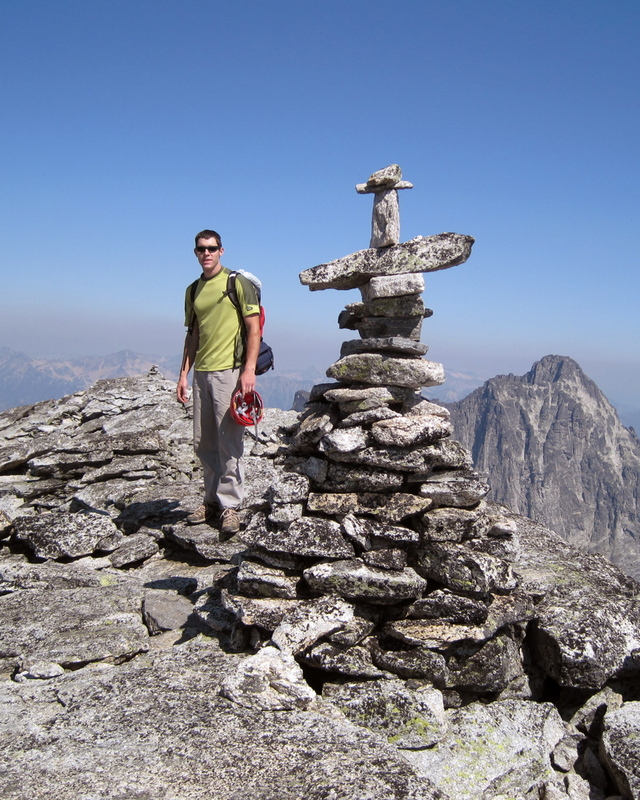 I was strangely pleased when a Google search of the Valhallas yielded only ample information on one climb - the popular South Ridge of Gimli - leaving the other peaks/climbs relatively untainted. There does actually exist a guidebook for the area. An out-of-print Columbia Mountains of Canada West & South (by Whipple) reportedly contains errors and lacks descriptions for more recent routes. 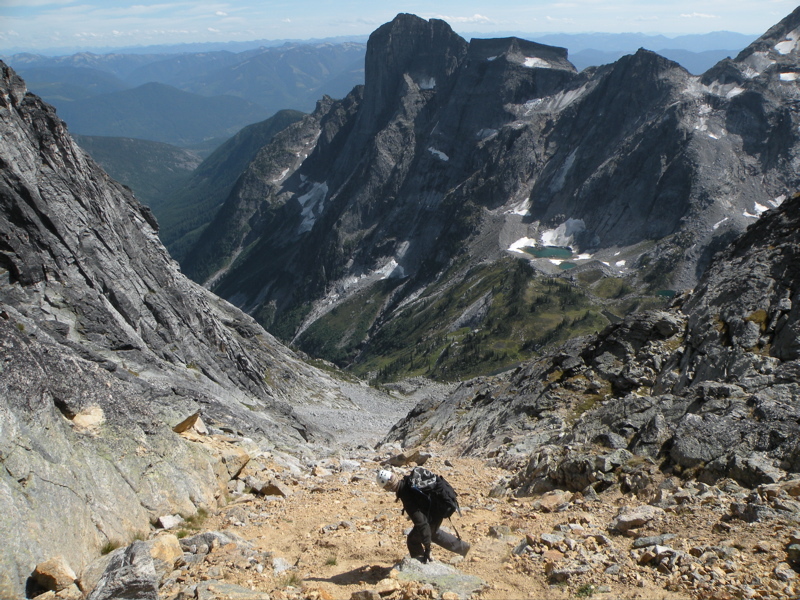 A new 2009 West Kootenay Rock Guide (by Kristiansen and Hempsall) provides some useful updated information on accessing the Valhallas, but contains only a few of the routes on just a couple of the peaks. 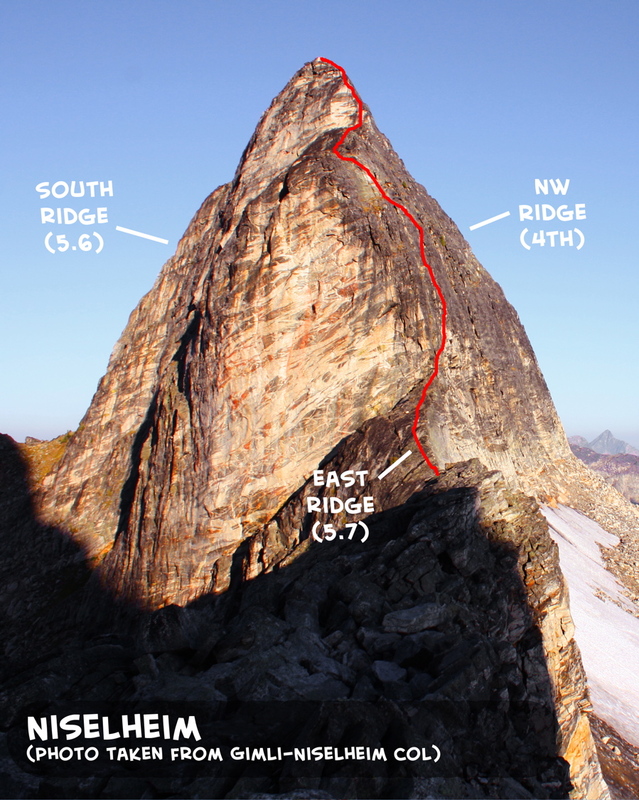 For most climbs in the Valhallas, the only route description that exists is the feature name (i.e. 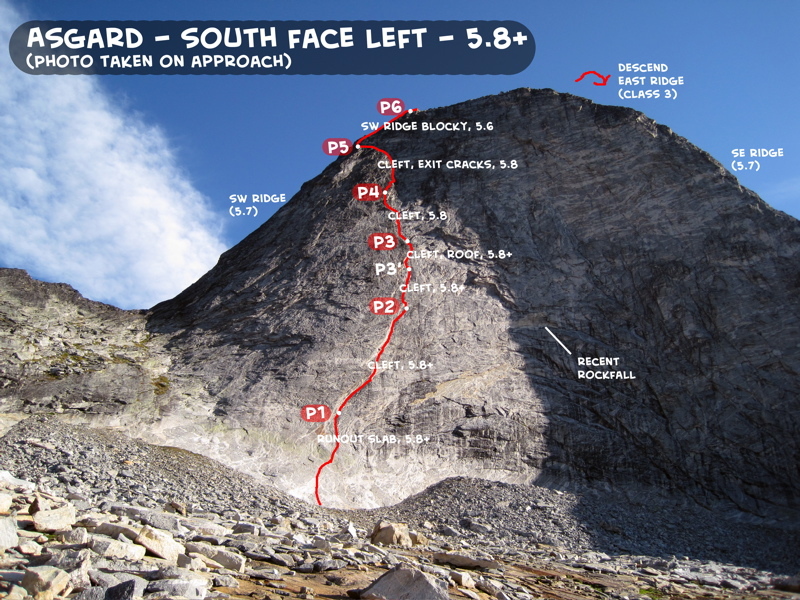 "south ridge", "east face", ect. 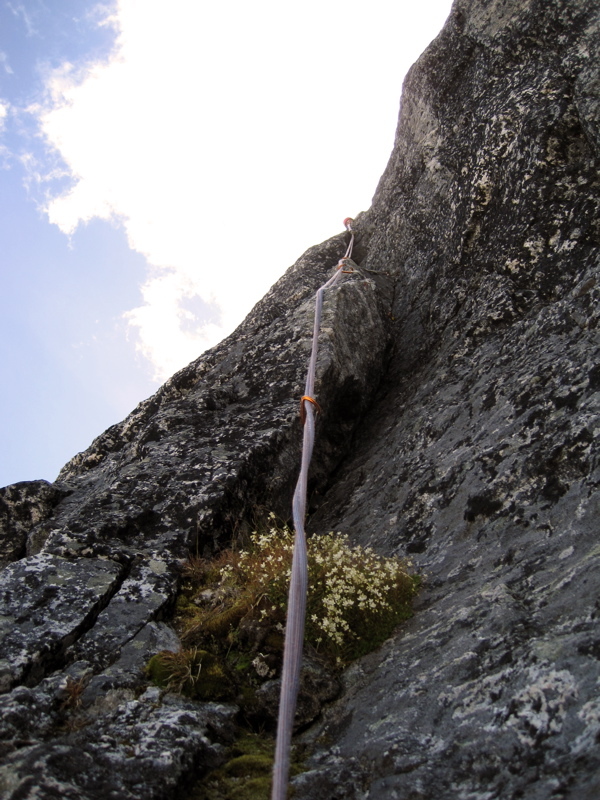 ), so finding and climbing the route lines on the peaks themselves is a challenge left up to the climber. Although I'm of the opinion that the Valhallas should be kept untainted by today's tendency to overdo route beta, I've put together a webpage summarizing the useful information on the Valhallas that I was able to glean from the guidebooks and internet searches. I've also provided lots of photos and trip reports for the climbs I've done in the Valhallas, but I've tried to leave the beta on the climbs themselves relatively vague. As I mentioned, most climbs in the Valhallas are just described by their feature name. 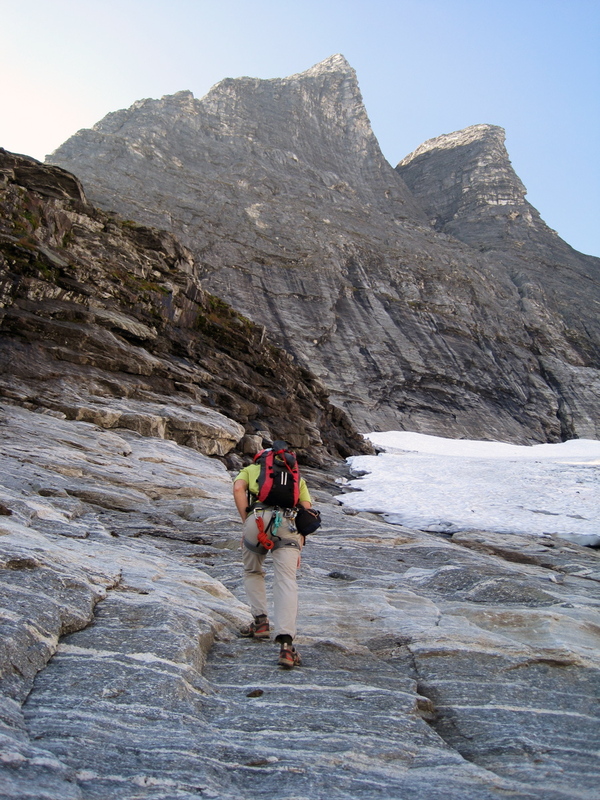 GO TO my WEBPAGE that has an OVERVIEW of the VALHALLA RANGE, including MAPS, APPROACH, CAMPING, and PEAKS/CLIMBS. 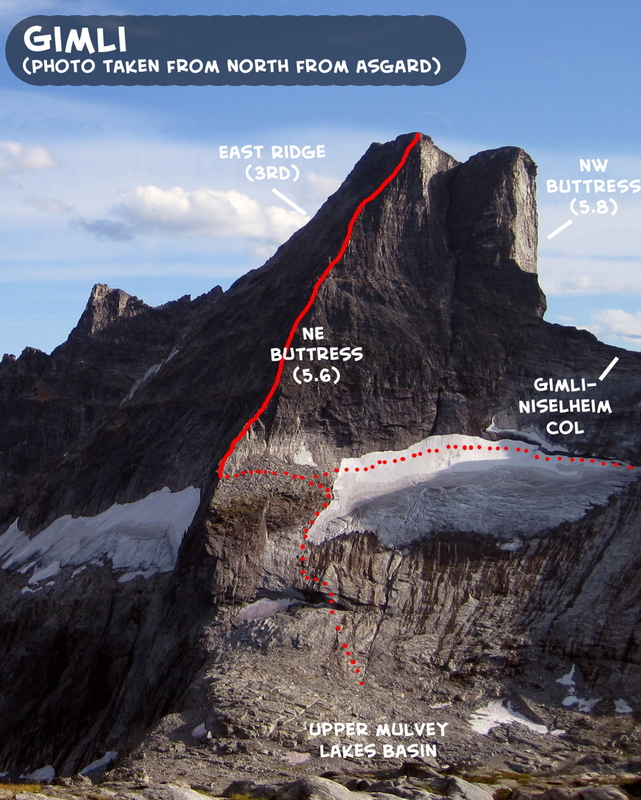 Gain the buttress by traversing in from the west (from the glacier or from below up slabs and mossy blocks) to where the ridge steepens above a blocky ledge. 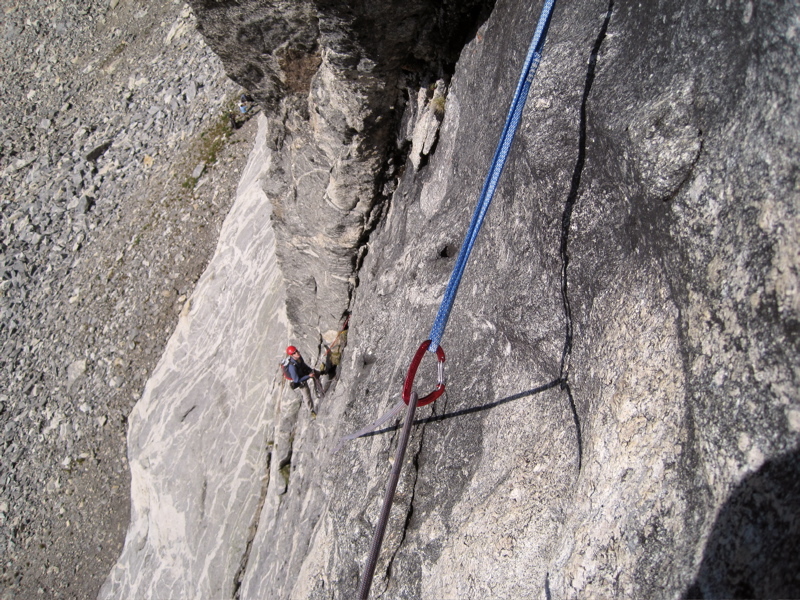 Climb up the buttress on low 5th terrain (up to 5.6) for several pitches. Easier terrain can usually be found on the east side of the crest. We simulclimbed. Descend via the East Ridge (3rd). 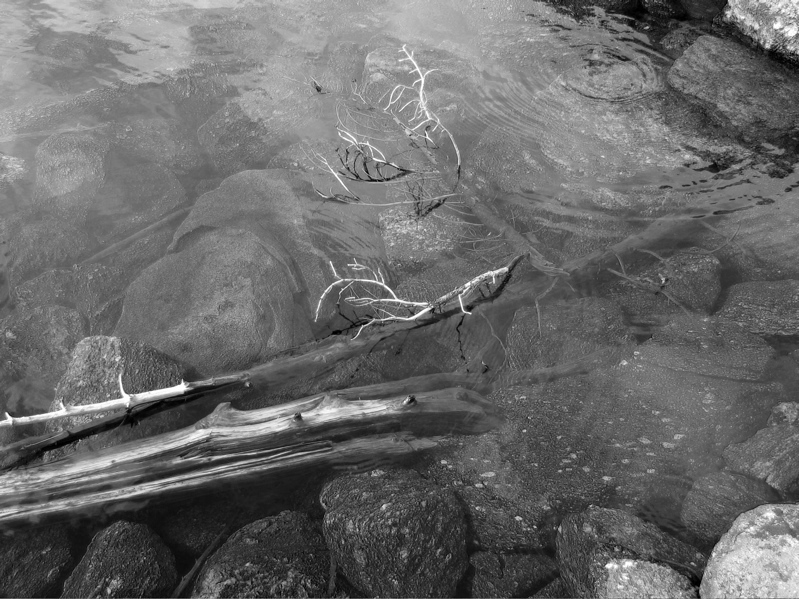 Photo overlay. 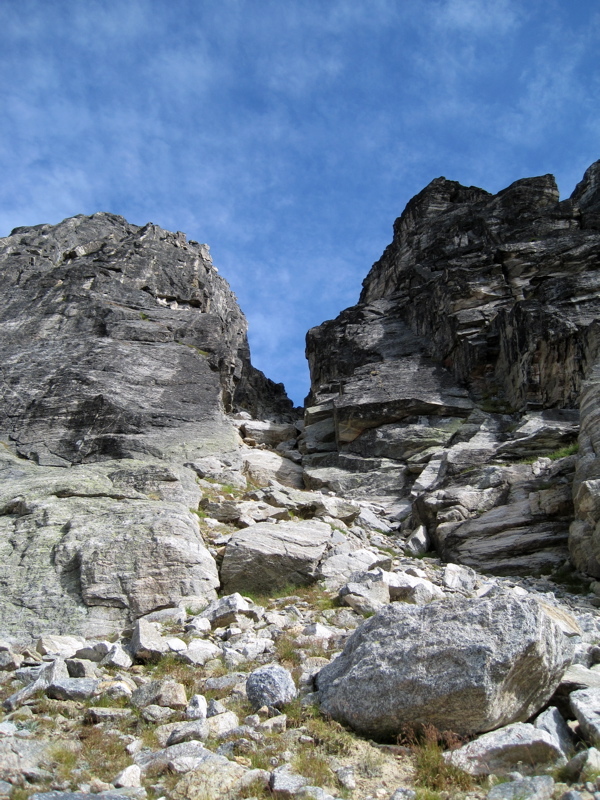 The NE Buttress of Gimli as seen from the north (from summit of Asgard). 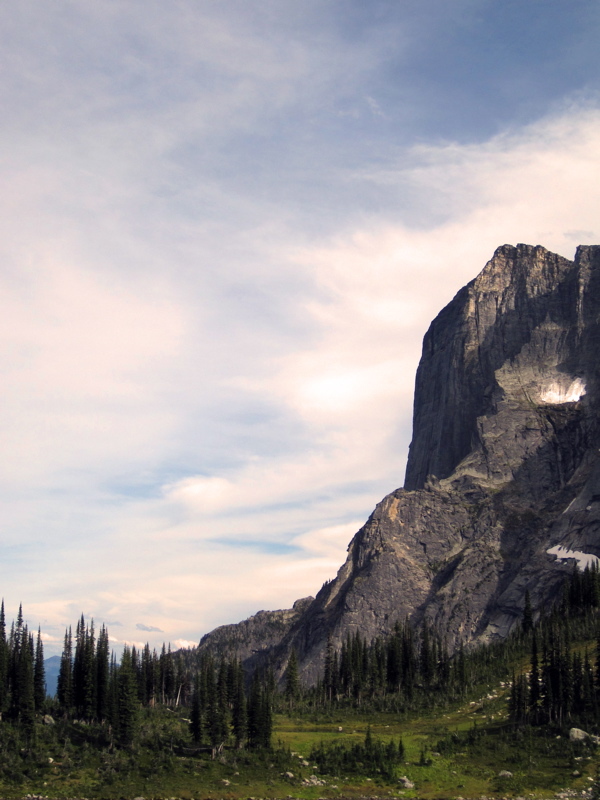 The NE Buttress of Gimli as seen from the west (from upper Mulvey Basin). 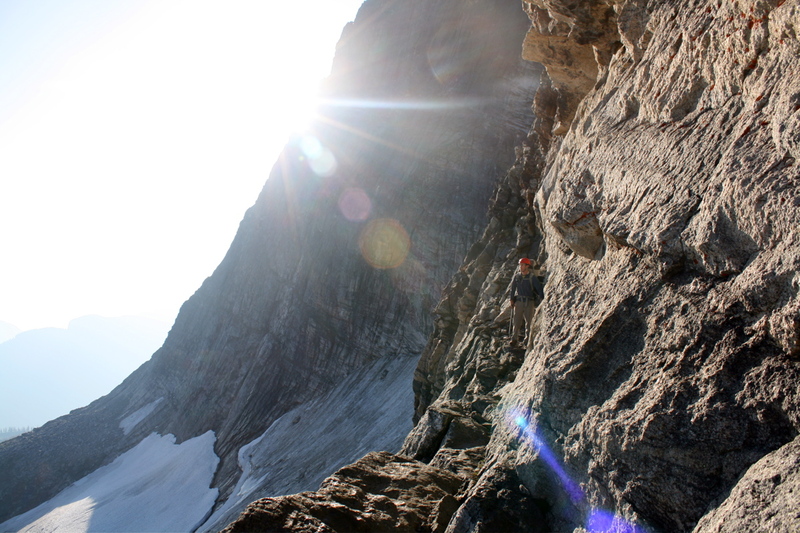 Scrambling an easy ledge system down north side of Gimli-Niselheim col to get to the north side of Gimli. The sun is over the NE Buttress. 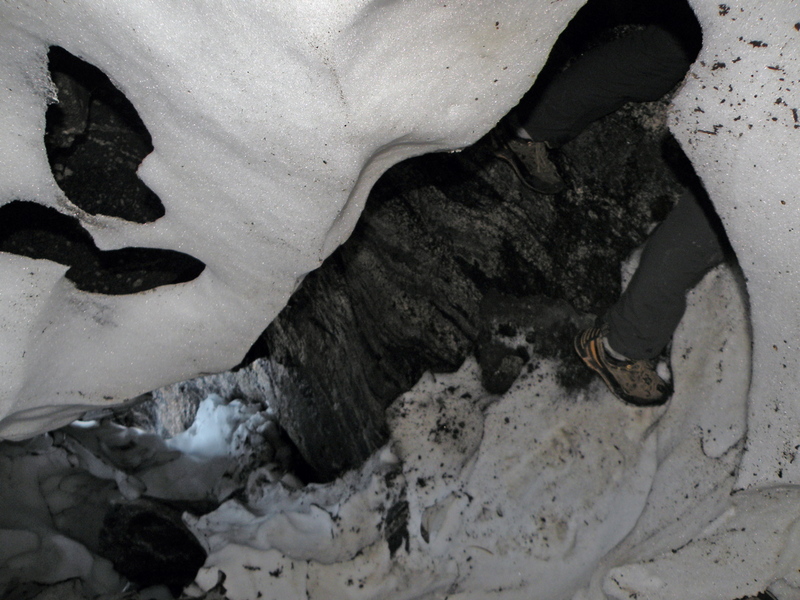 We chose to get on the buttress from below the snow. Fun in the moat along the edge of the snow as we climbed up to the buttress. More fun in the moat. Notice my foot in this photo! 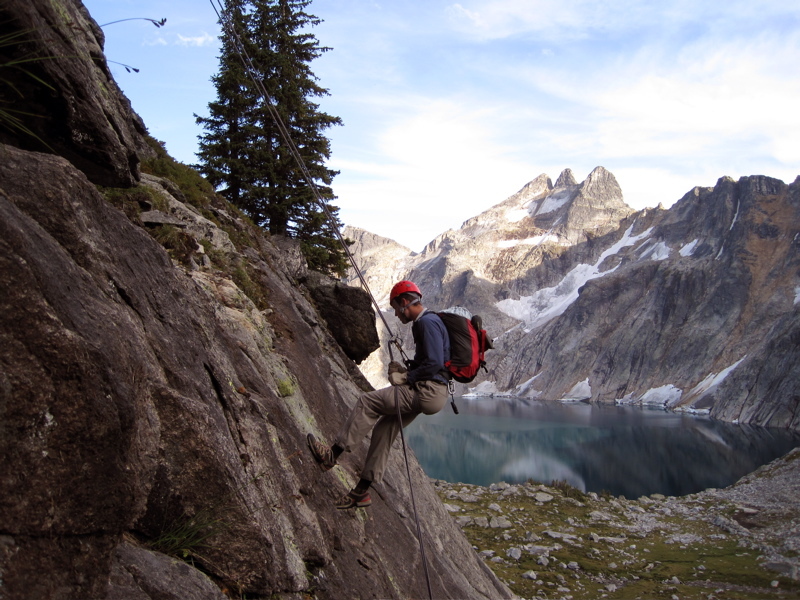 Scrambling and simulcimbing on the buttress crest. Mulvey Lake looks pretty inviting below. A guided party in Mulvey Basin. 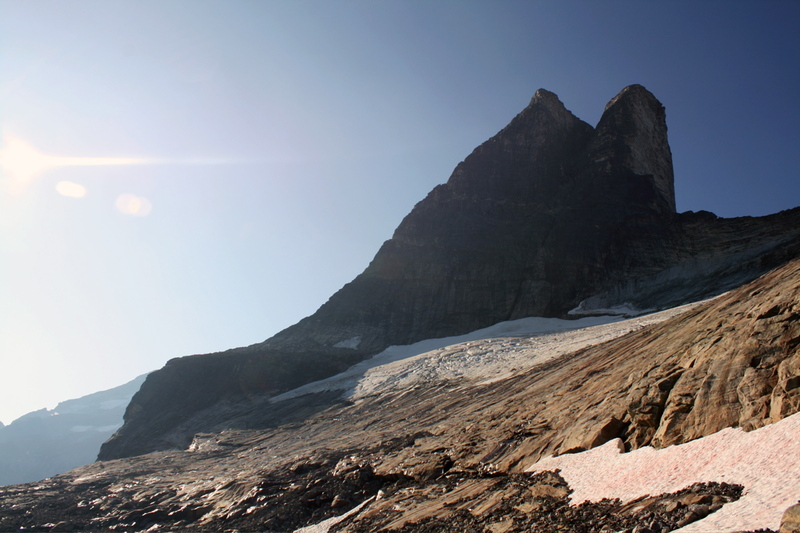 Every year at the end of August the Alpine Club of Canada leads a guided trip in the Valhallas. David on the summit. Beginning the East Ridge descent. 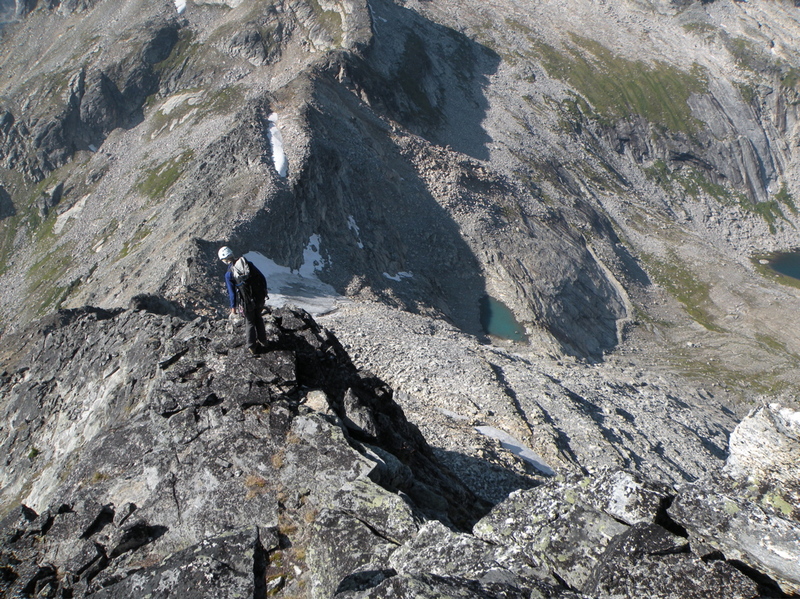 The East Ridge descent (from my TR for the S Ridge of Gimli from a previous trip to the Valhallas). 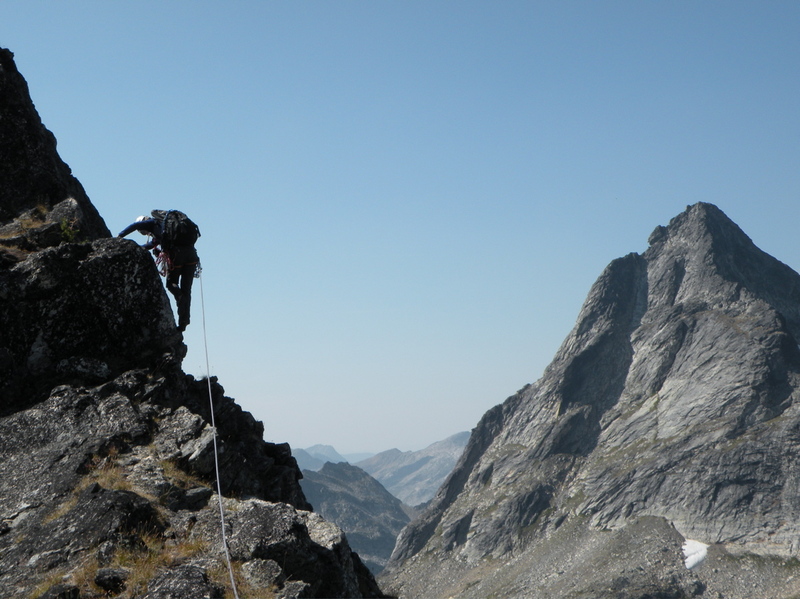 From the Gimli-Niselheim col, climb up the ridge for 2 pitches to the top. There are some fun exposed moves on the steep northern flank of the ridge. 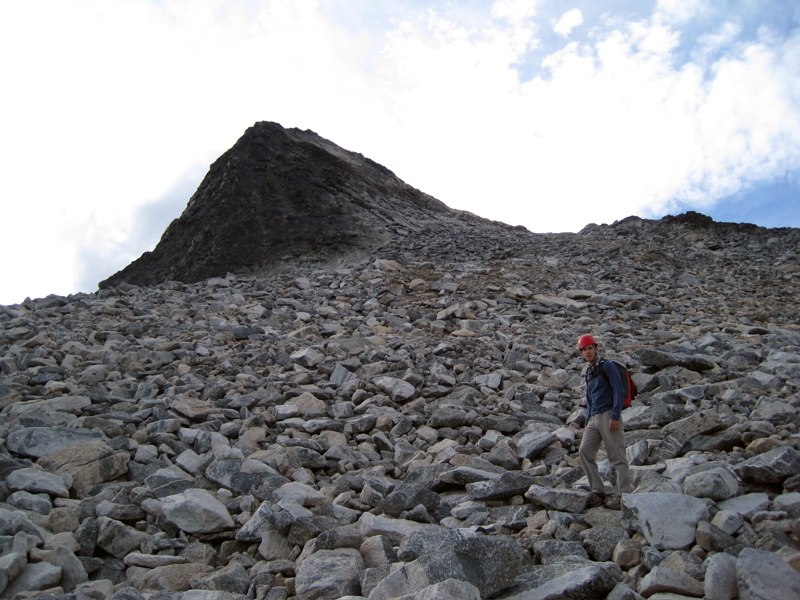 Descend via the NW Ridge (4th class). Photo overlay. 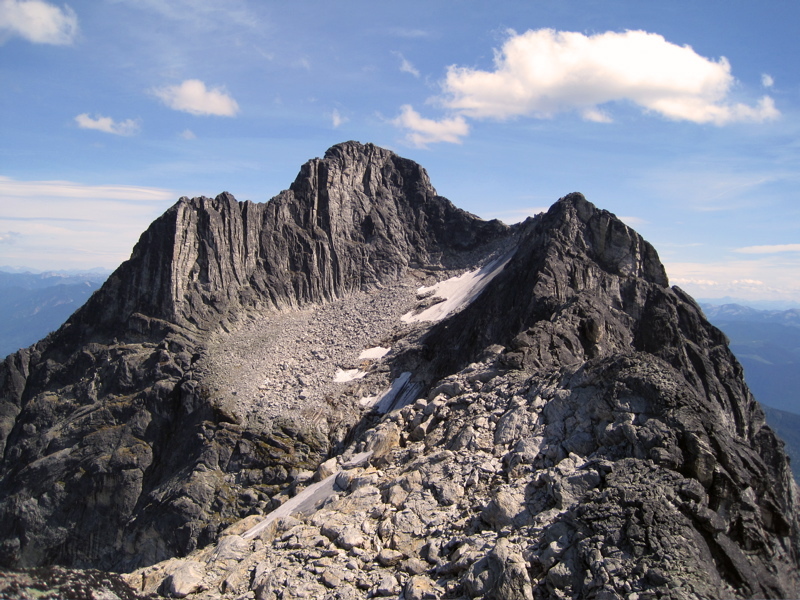 The E Ridge of Niselheim as seen from the east (from Gimli-Niselheim col). 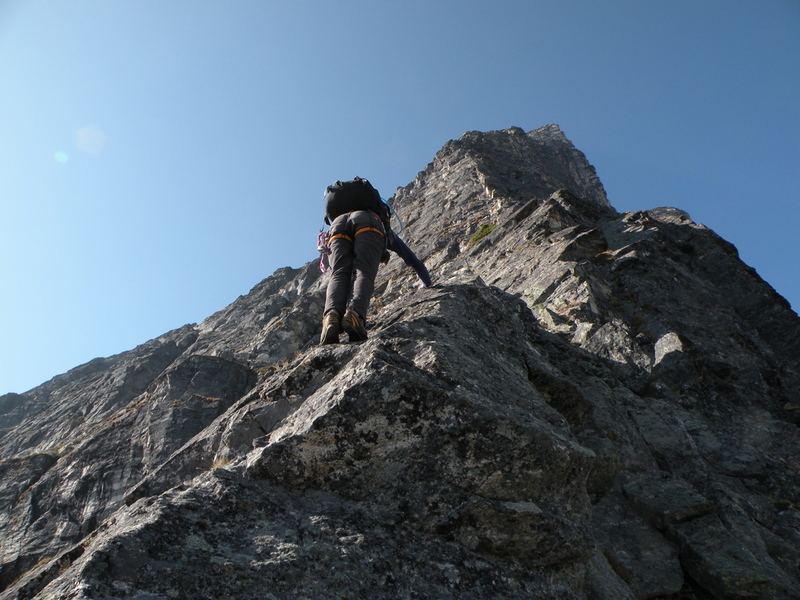 Steep climbing on the north side of the ridge. Midgard in background. Fun exposed ridge climbing. Midgard in background. A nice view of Gimli from the summit of Niselheim. Class 4 descent down NW ridge. 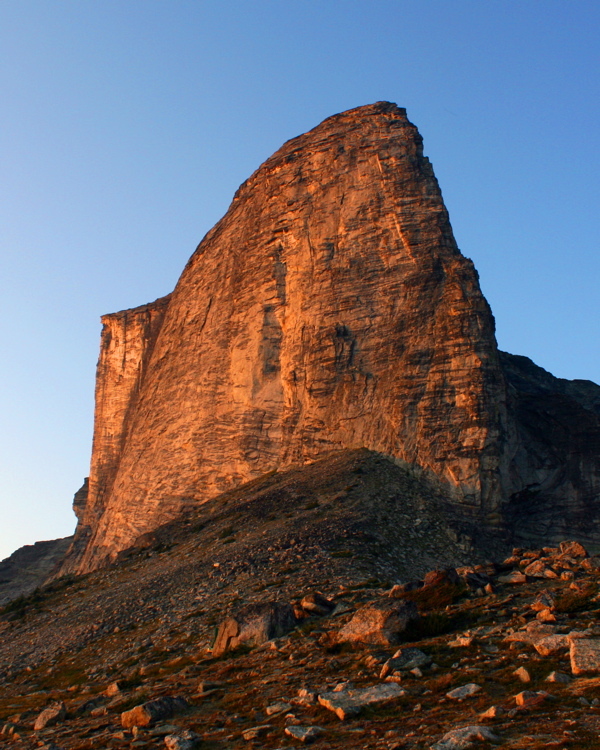 From the base under the left side of the imposing south face, climb a runout slab to a right-leaning arch. 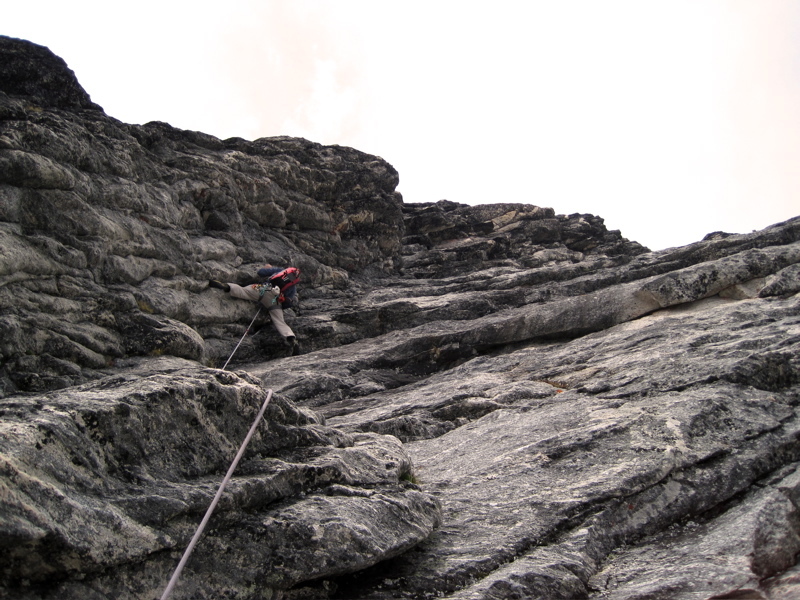 Then climb about 4 pitches in the cleft, and exit on cracks/ledges to gain the final pitch of the SW Ridge to the summit. 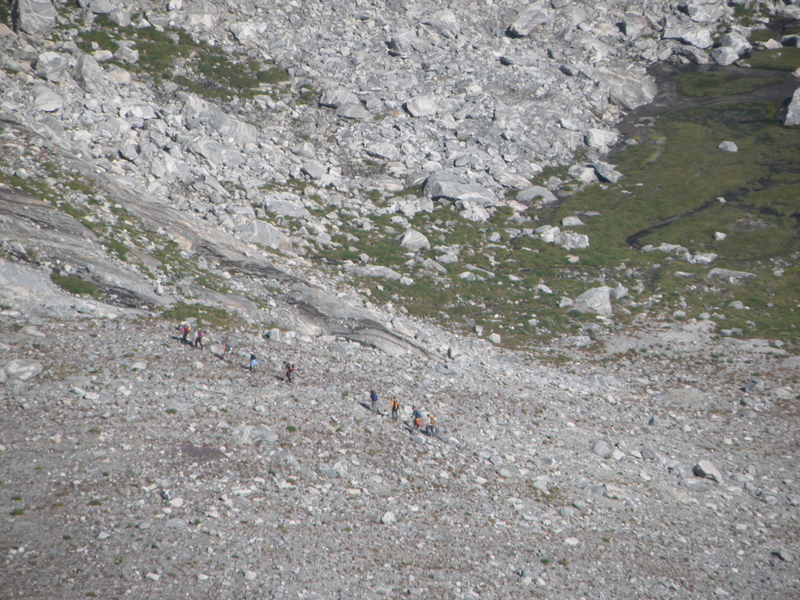 Descend via the East Ridge (3rd). David heading up the slab. No bolts to make it easy, that's nice! Pitch 1 of 4 in the cleft. 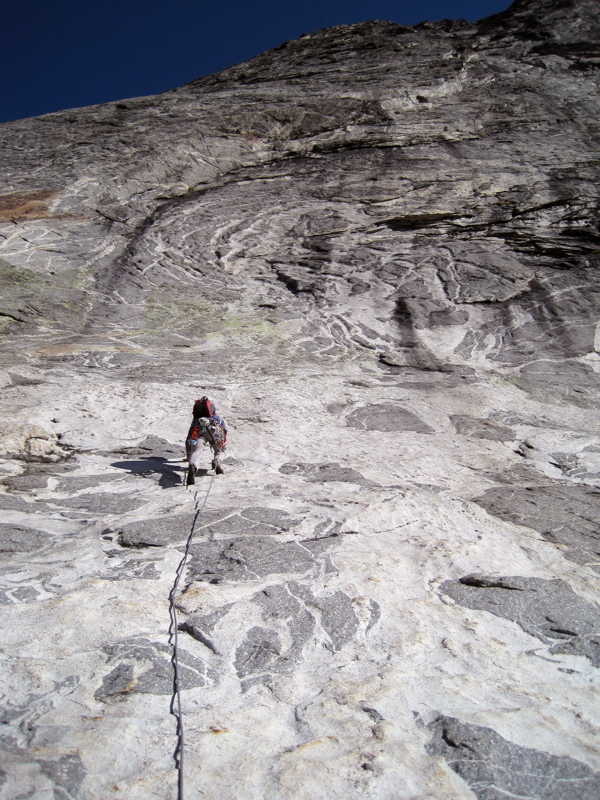 Some great climbing, runout enough to keep you on your toes! An old piton. Pitch 2 of 4 in the cleft. More great climbing! 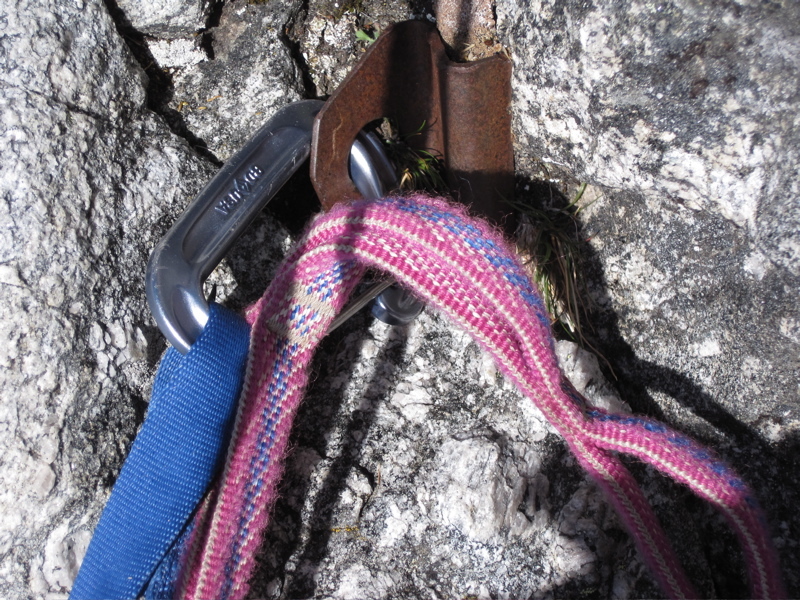 Another hanging gear belay. Pitch 3 of 4 in the cleft. Still more great climbing. Pitch 4 of 4 in the cleft. Need I say, the climbing is still great and still a tad runout. 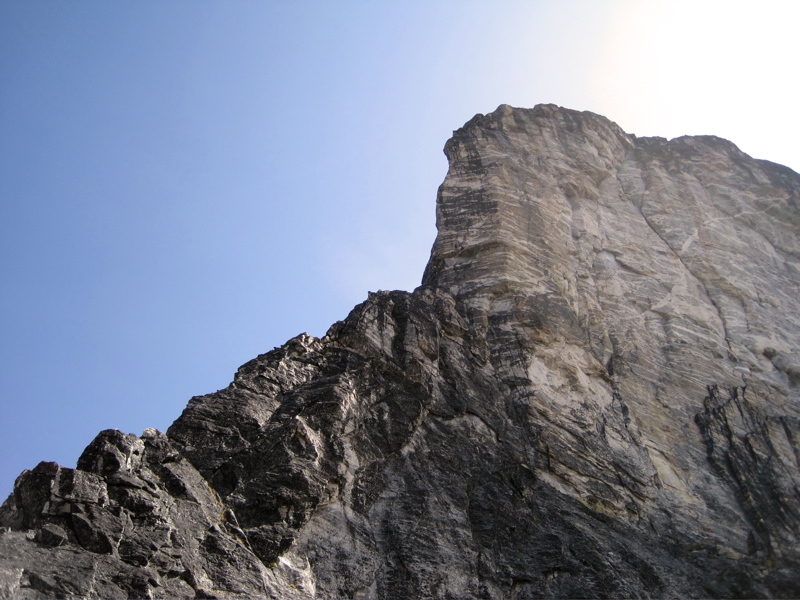 Eventually the route exits the cleft onto the SW ridge. There are several options, like this one. 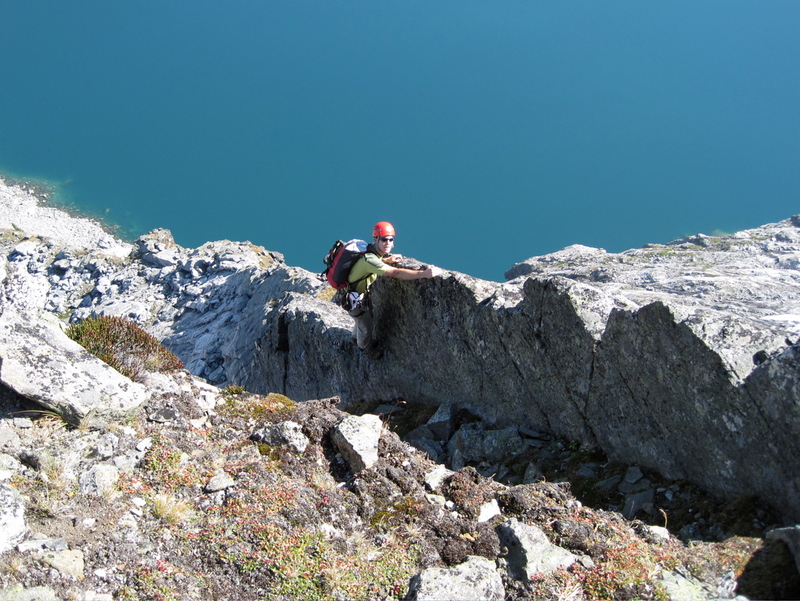 David on the summit.. Class 2/3 talus field descent down East Ridge. 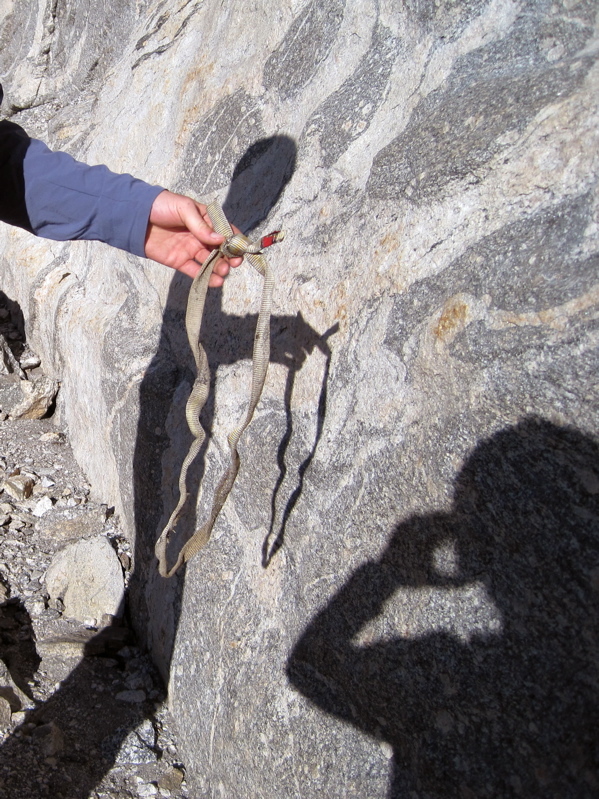 We tried to cut down to camp too early in our haste to cook up some mashed potatoes and hot chocolate, and ended up rappelling a slab to get to the basin. Wolf's Ears and Mulvey Lake in the background. "Little" Gladsheim (I afterwards learned it is called Trireme Wall, but we had called it "Little" Gladsheim during our trip, so the name stuck for us) is the high point on the east end of the Gladsheim massive. The true (i.e. highest) summit of Gladsheim is on the east end of the peak. 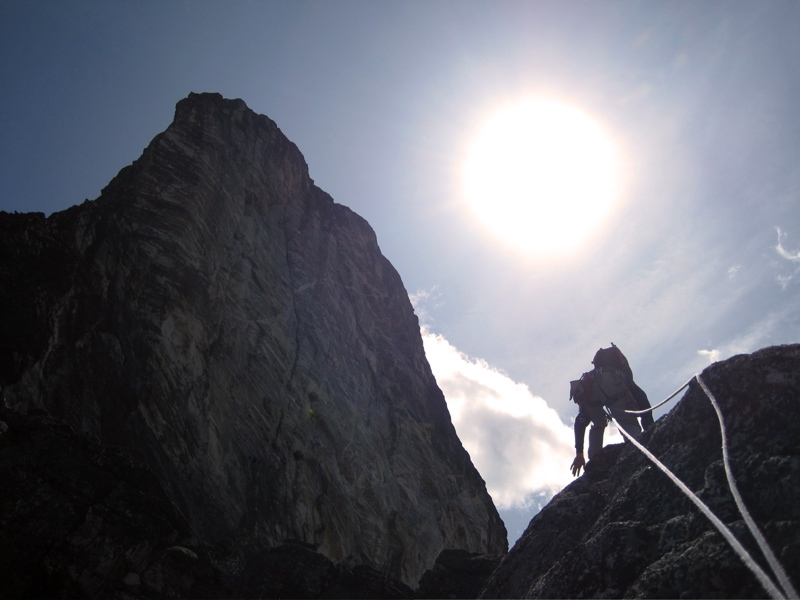 To climb "Little" Gladsheim, ascend a gully on the west side of the Gladsheim massive. 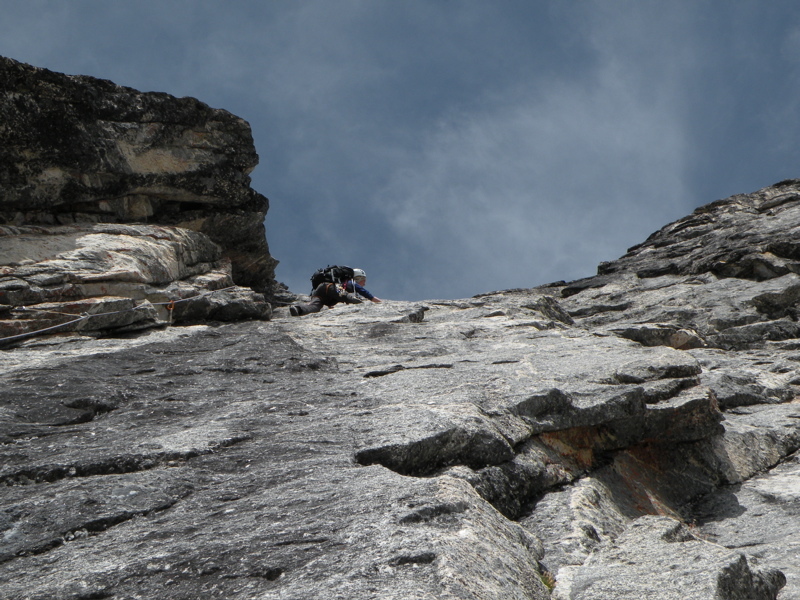 Climb 4 pitches on the sweeping ridge. The final pitch takes a flaring groove on the north side. Descend via the main long gully (3rd) on the east side of the "Little" Gladsheim summit, or continue climbing to the main summit of Gladsheim via its West Ridge route (5.3). Photo overlay. Gladsheim as seen from SW (from Gimli-Niselheim col). Gladsheim as seen from below. "Little" Gladsheim is the highest point on the left side of the Gladsheim massive. 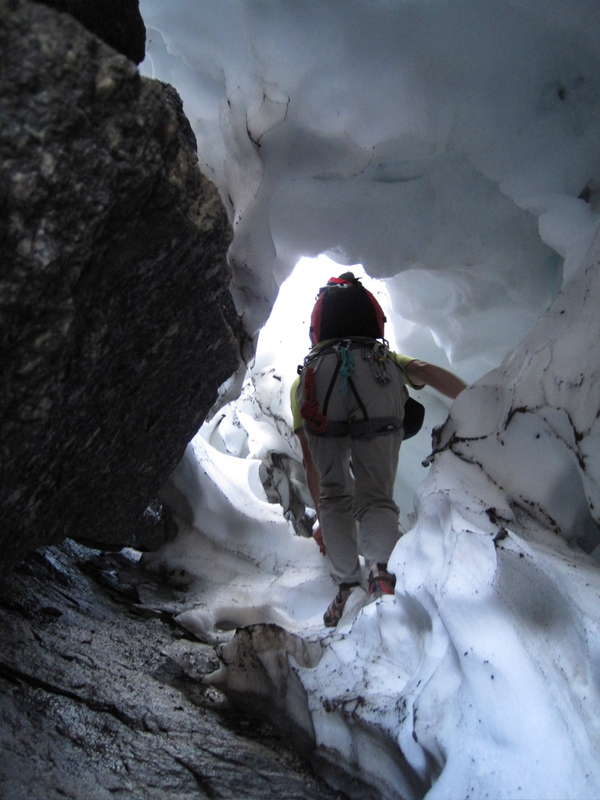 The gully approach on the west side of the Gladsheim massive. 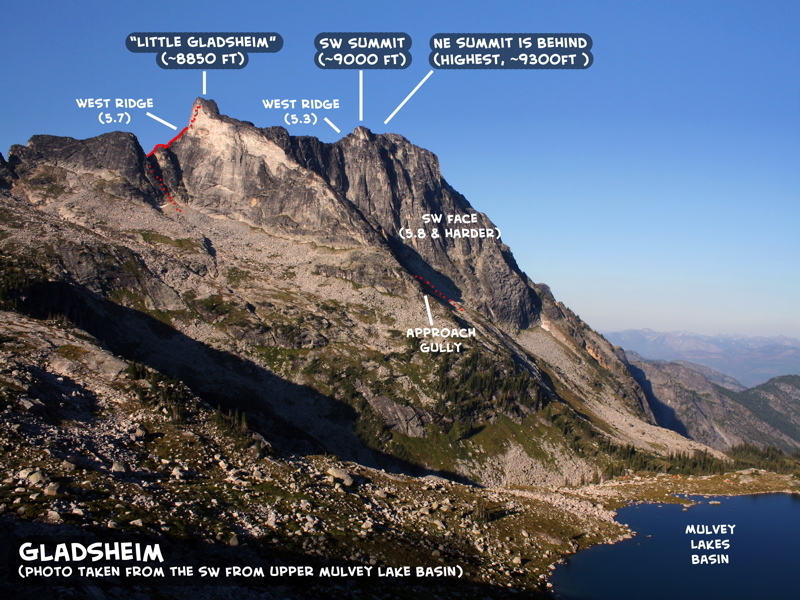 Note that this is NOT the gully you take to access the West Ridge route of Gladsheim, but instead the gully you climb to access the West Ridge of "Little" Gladsheim on the west end of the Gladsheim massive. 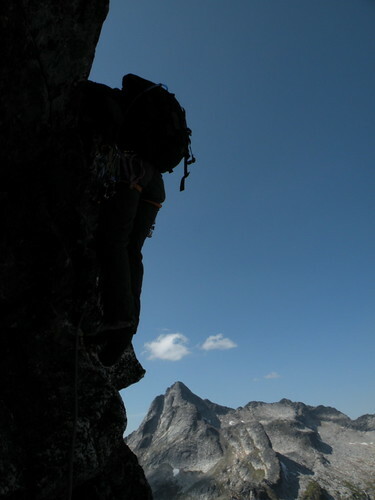 Climbing the West Ridge of "Little" Gladsheim. Some good ridge climbing! Another photo looking up the sweeping West Ridge. The flaring grove on the last pitch. David on the top of "Little" Gladsheim. Great views from here of the entire Valhalla Range. Looking over to the east to the true summit of Gladsheim. Can easily access the West Ridge of Gladsheim from here. 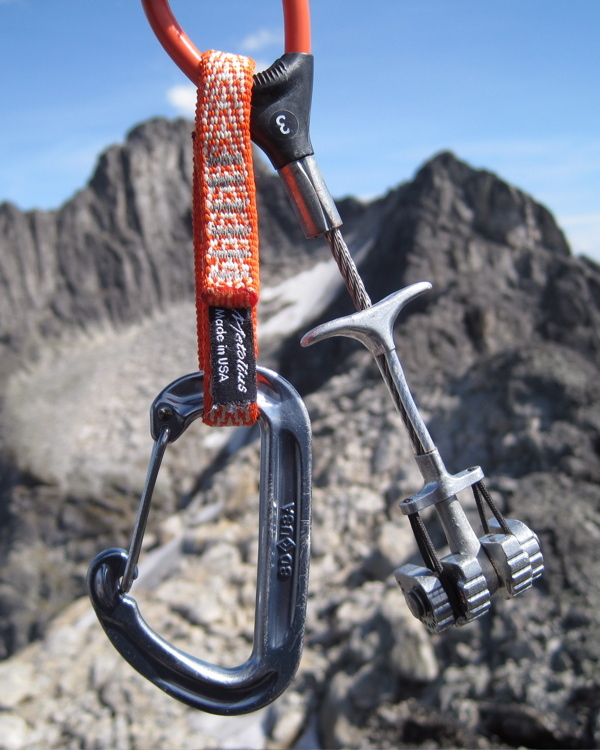 The orange Metolius was definitely our favorite and most-used piece on all our climbs in the Valhallas. Descending the long gully on the south side of Gladsheim. This is the standard approach gully. We had great views of Dag, Batwing, and Nott during the descent. The towering SW Face of Gladsheim. 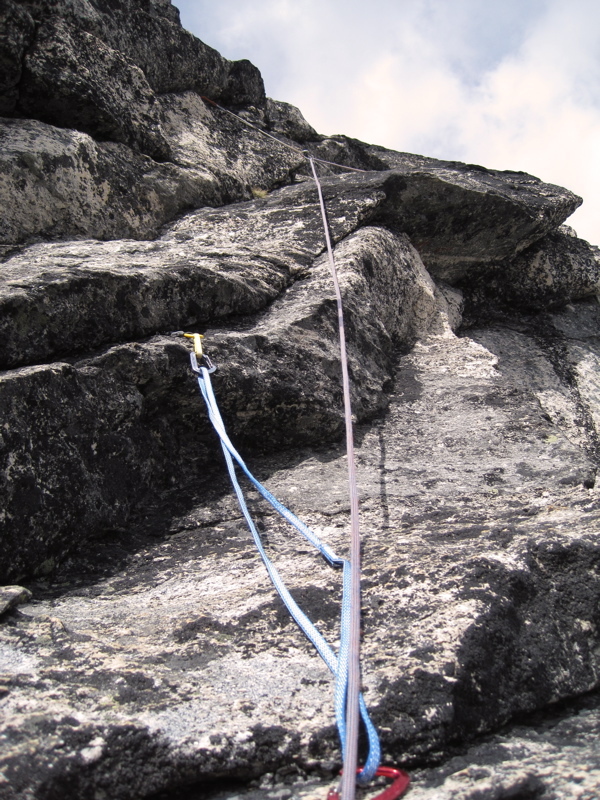 Apparently some good routes, if you can find them! 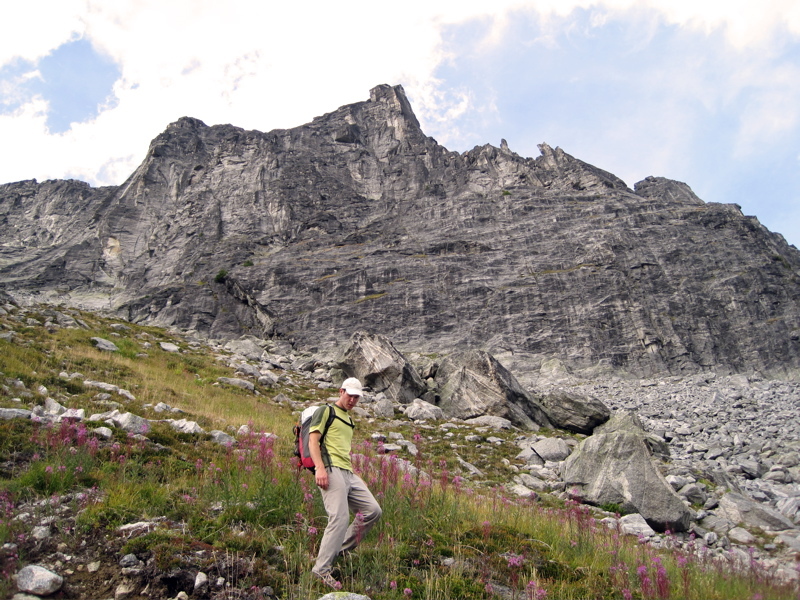 The descent from Gladsheim gave us the opportunity to explore the lower basin, which is quite beautiful, with lush meadows, sparkling tarns, and towering north faces of the surrounding peaks. The north side of Dag is quite impressive. 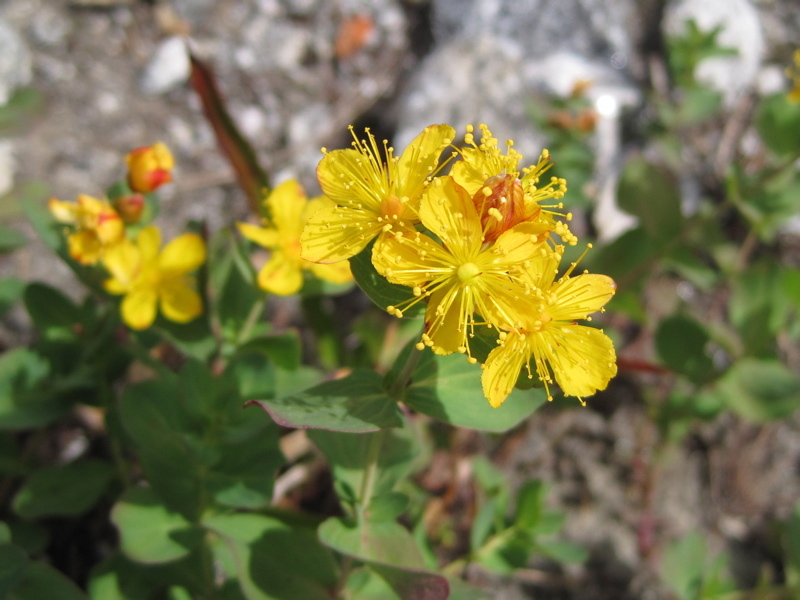 Flowers on the descent. 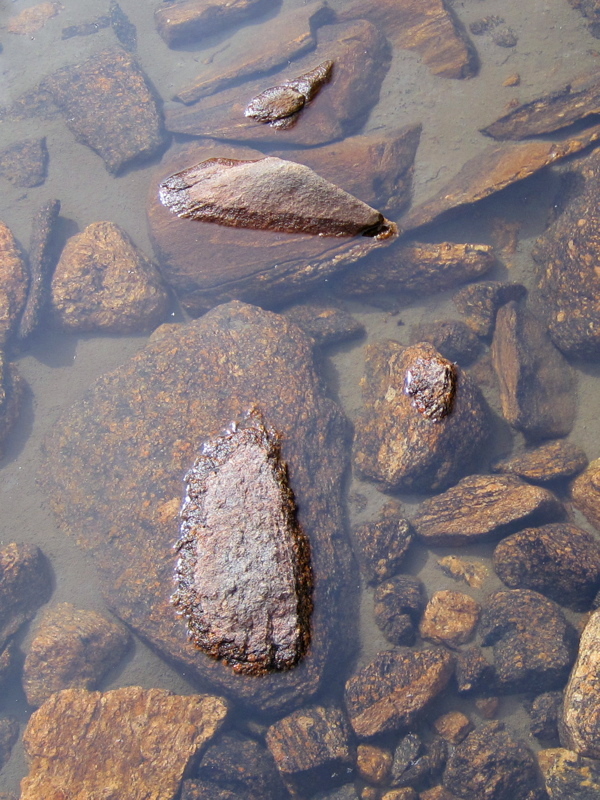 Rocky lake in the lower basin. 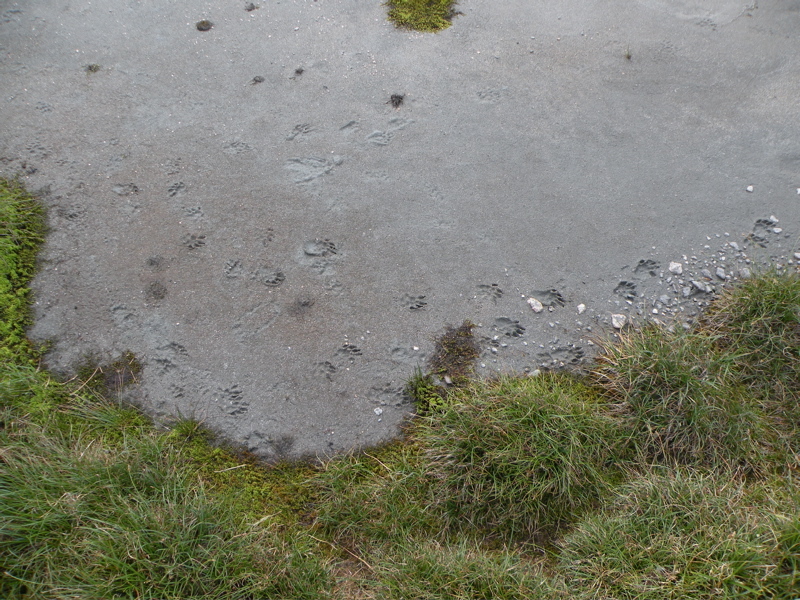 Another artistic lakebed photo. 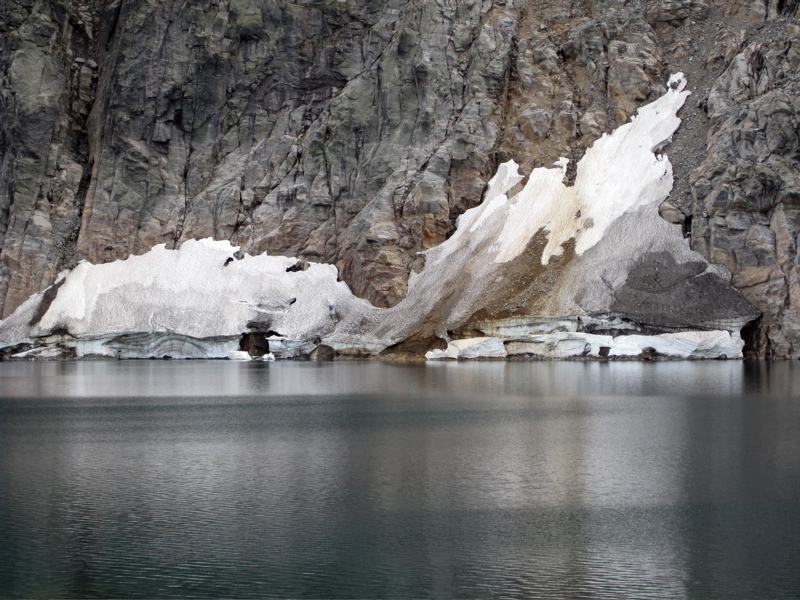 Glacier remnants around Mulvey Lake. These glaciers won't be here too much longer. 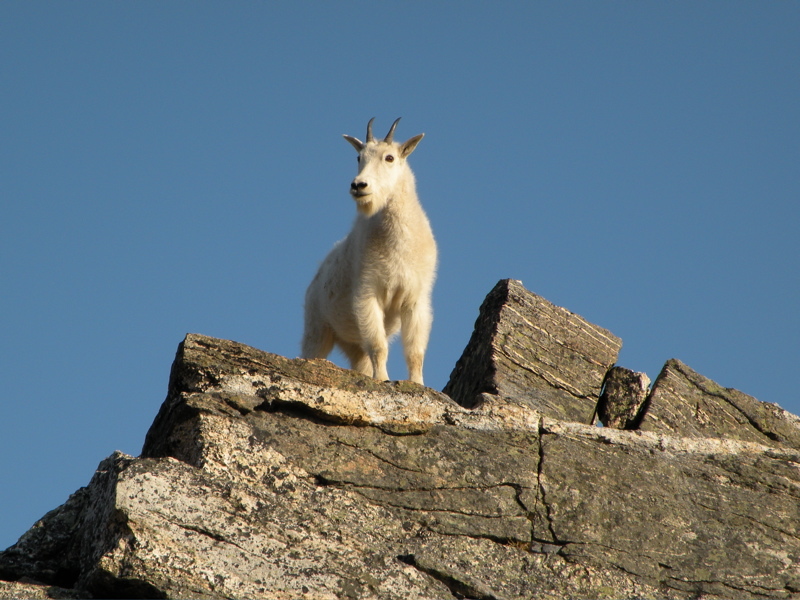 Friendly mountain goat. 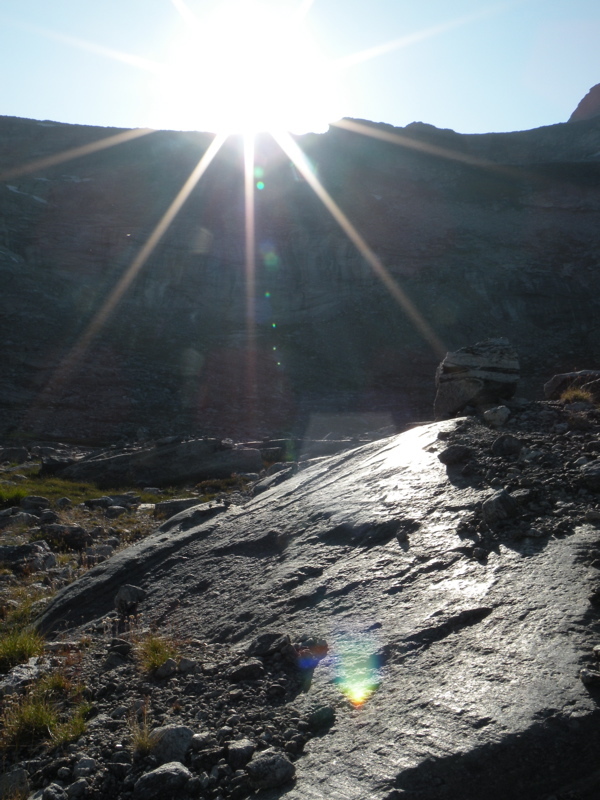 Sunset through rocks at camp below S. Ridge of Gimli (Mt Prestley in distance). Alpenglow on Gimli. 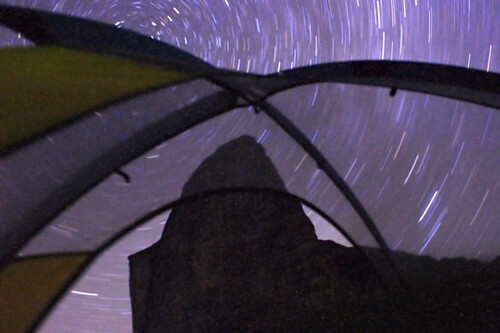 Star trails over Gimli from the tent (23 minute exposure). 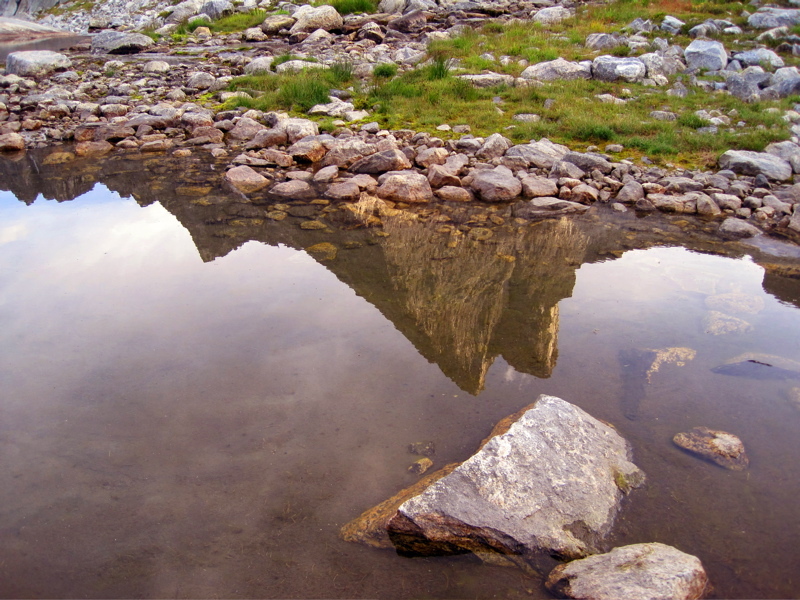 Reflection of Gimli in tarn in upper Mulvey Basin. Nighttime at camp. Poor David had to deal with my nighttime photography antics. He was probably glad when I ran out of batteries (I brought 10) on the last night! 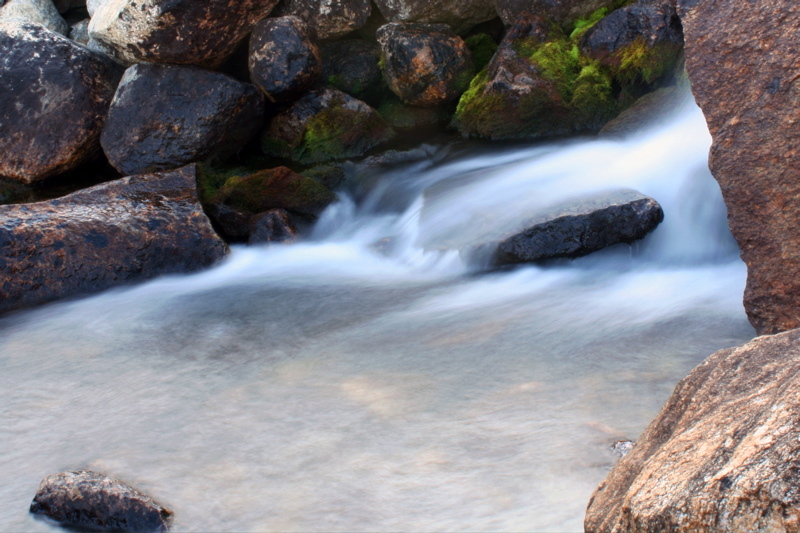 Silky stream in upper Mulvey Basin. Sunrise over Mulvey Lake. 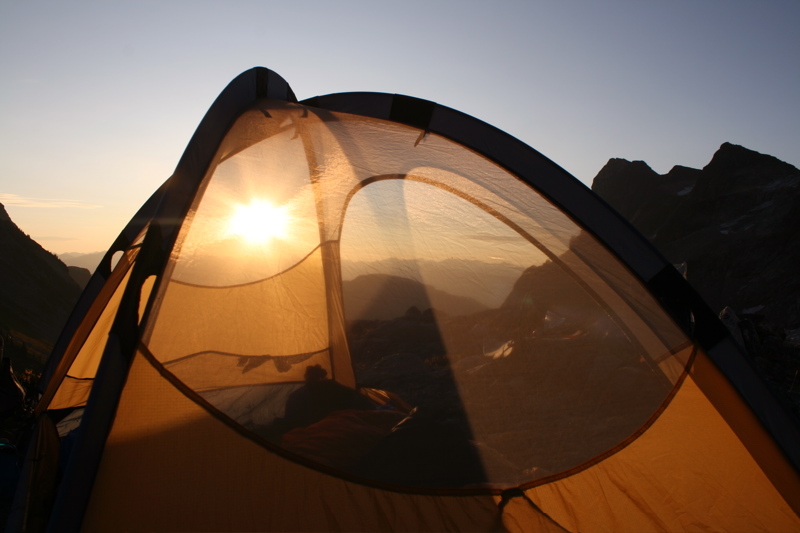 Sunrise from camp in upper Mulvey Basin. 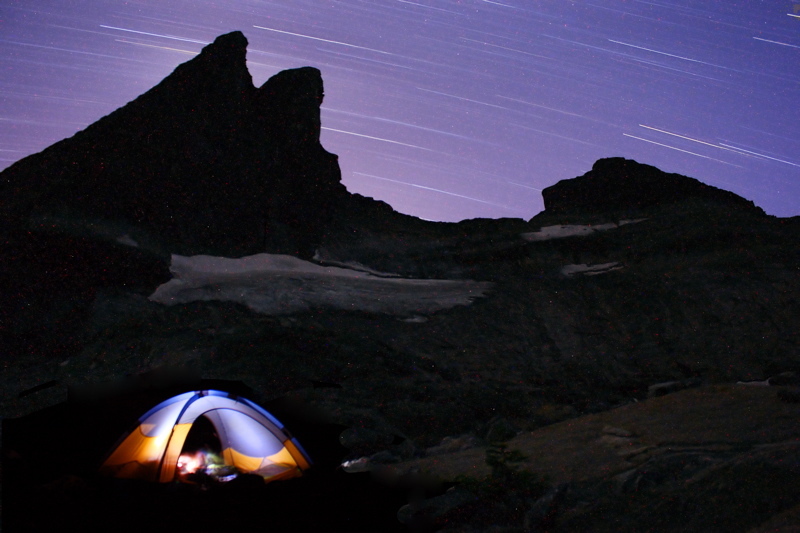 Star trails over camp in upper Mulvey Basin, Gimli and Niselheim behind (80 minute exposure). 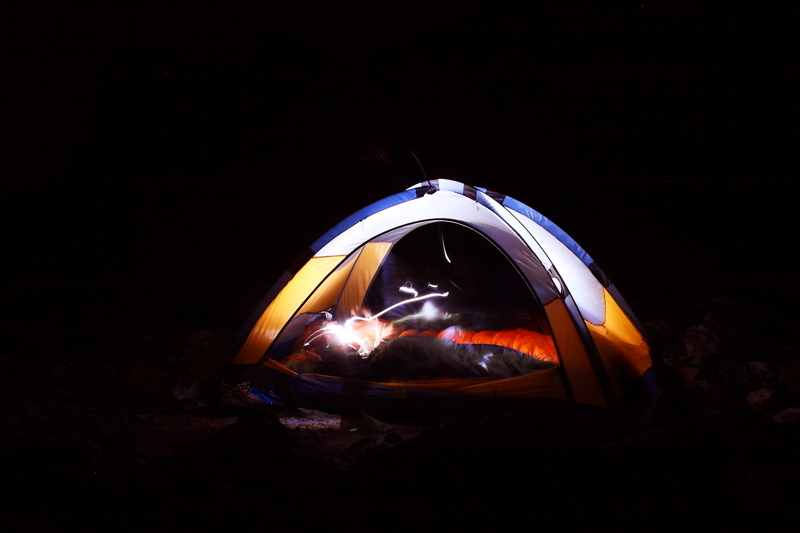 Another night photo at camp in upper Mulvey Basin, Gimli behind. 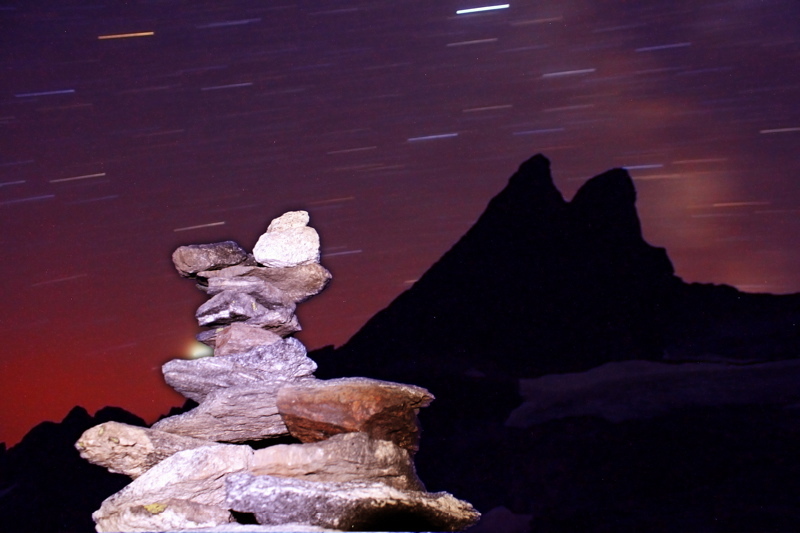 I lit the cairn with my headlight for a few seconds during the 30 minute exposure. 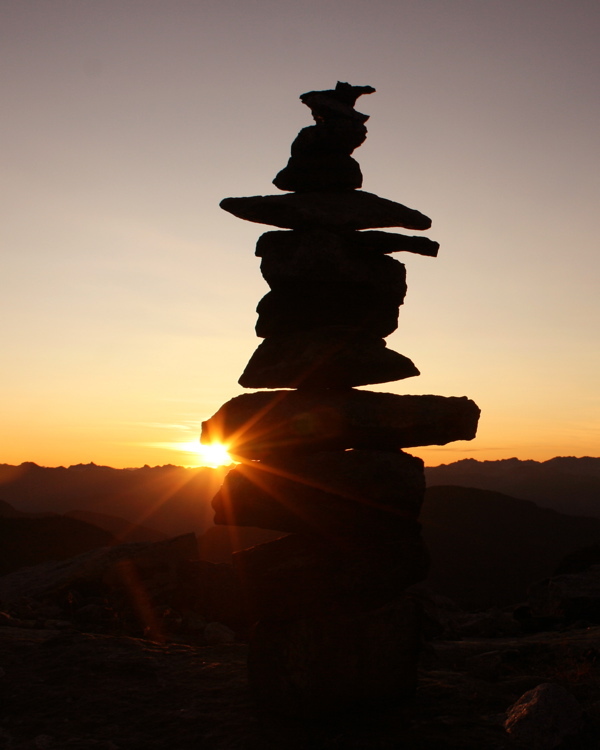 Sunrise over a cairn. A cool cairn someone built along the trail replicating the lines of Gimli in the distance. David recently graduated with a BS in Geology. I had gotten my BS in Engineering Geology. It was nice to have someone who enjoyed stopping to look at rocks as much as I do! The geology of the area is pretty cool. Here are a few photos we took. Thanks to David for identifying most of the stuff, as my geology knowledge has gotten rusty in the past few years.... Good quote from a mineralogy textbook: "Students are cautioned that these are generalizations, subject to the usual disclaimer that Mother Nature may not have read this book to discover what minerals are supposed to occur in each geological environment. 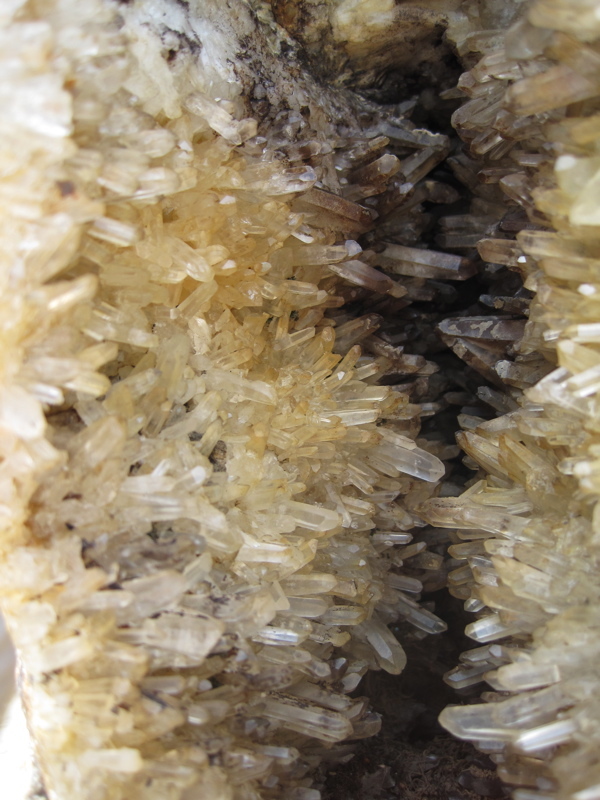 If we discover minerals occurring in unlikely environments, it is not that the minerals are in the wrong place, it is that our understanding of the mineral formation is imperfect." 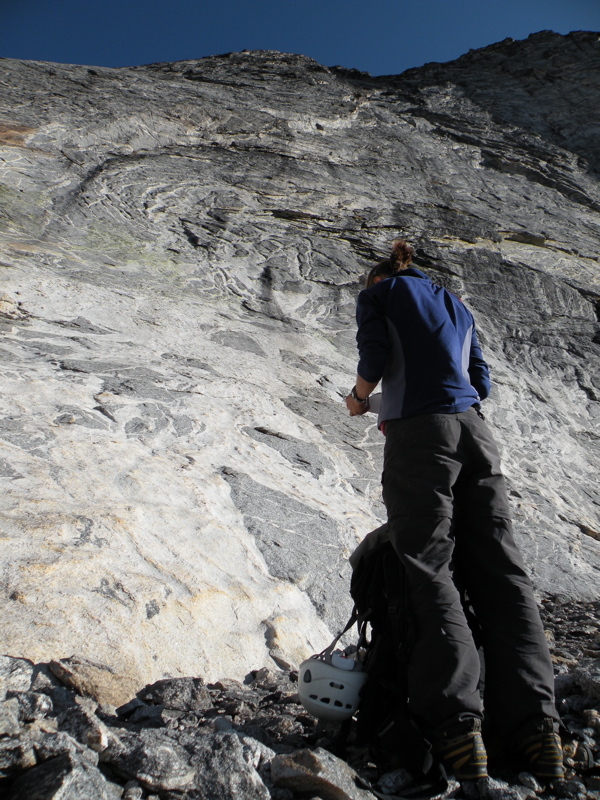 Lots of glacier polished slabs in Mulvey Basin. 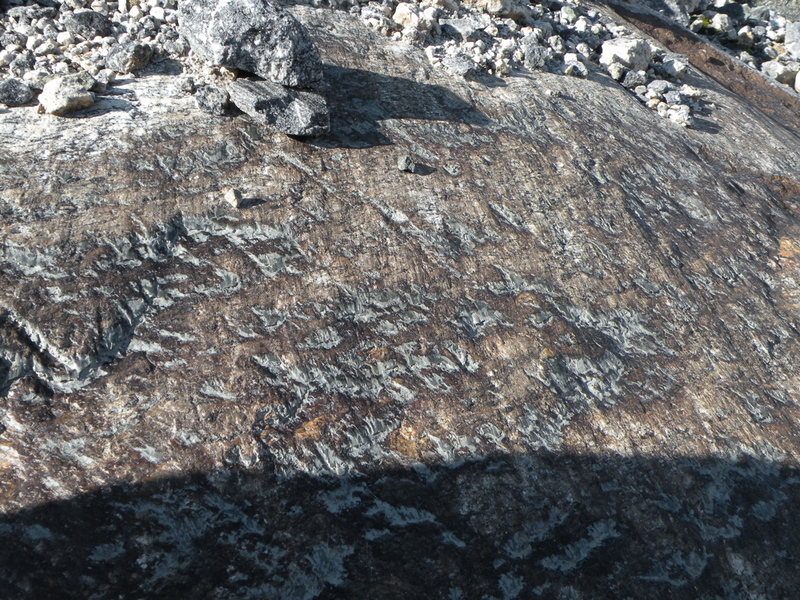 Glacially polished slab. 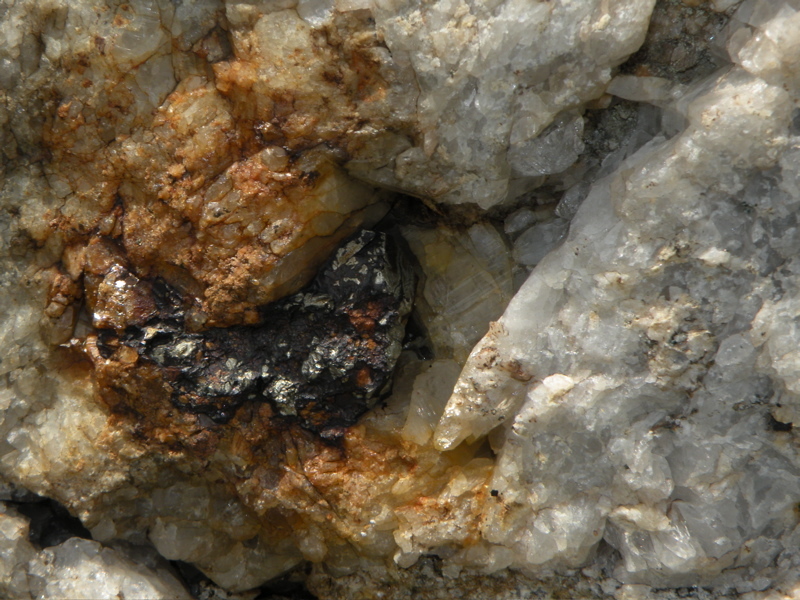 Brownish color is due to a weathering varnish, and the gray in the hollows and gouge marks is carbonate precipitate. 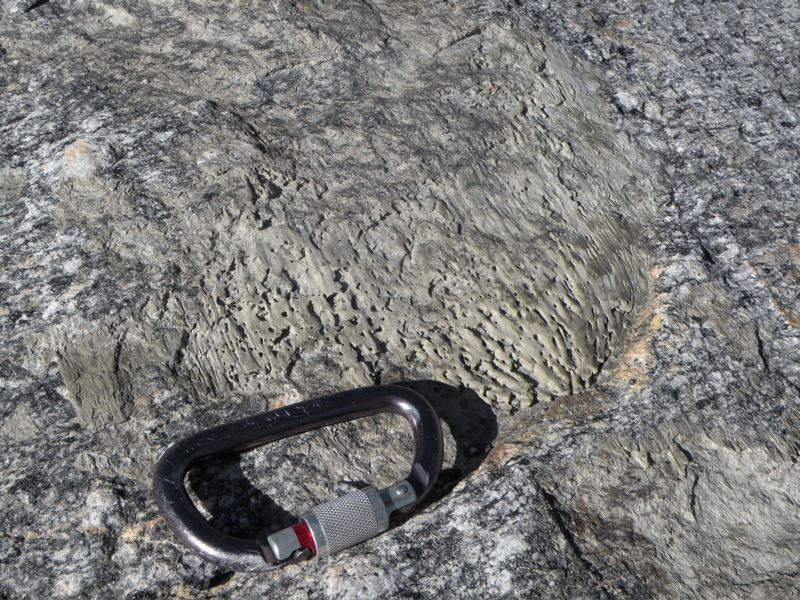 More carbonate precipitate in a hollow on a glacially polished slab. 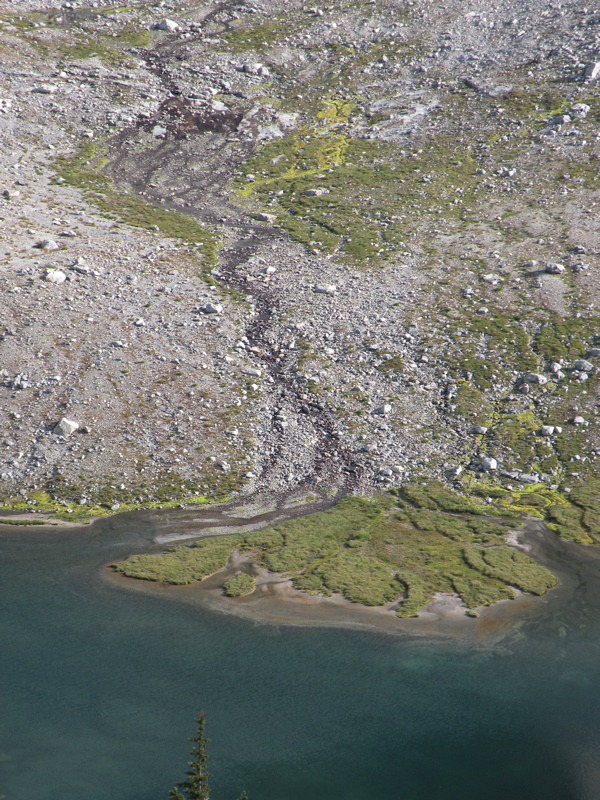 This is an indication of subglacial meltwater processes (namely regelation, aka pressure melting of ice), and you can even see flow lines in this deposit. A textbook example! 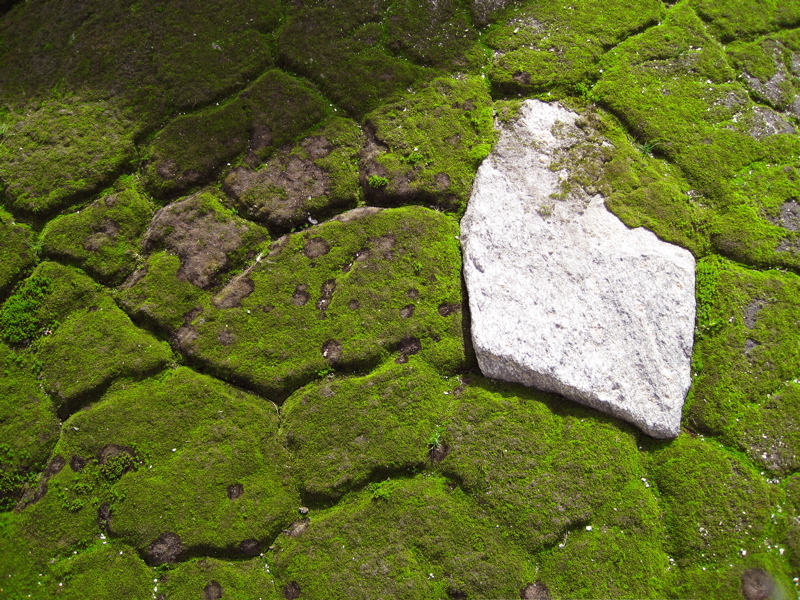 Delta formation example. 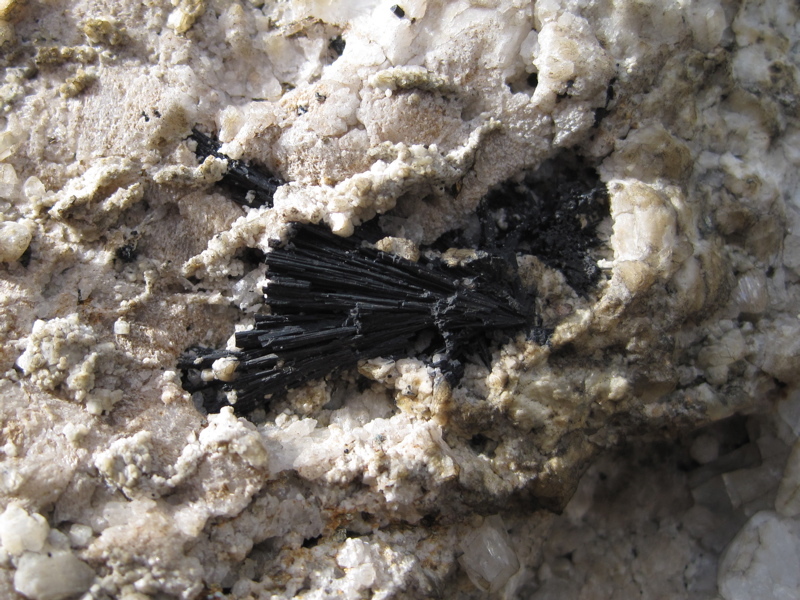 Most likely rutile, which is more common as an accessory mineral associated with quartz, but larger crystals such as this one are generally restricted to pegmatites. 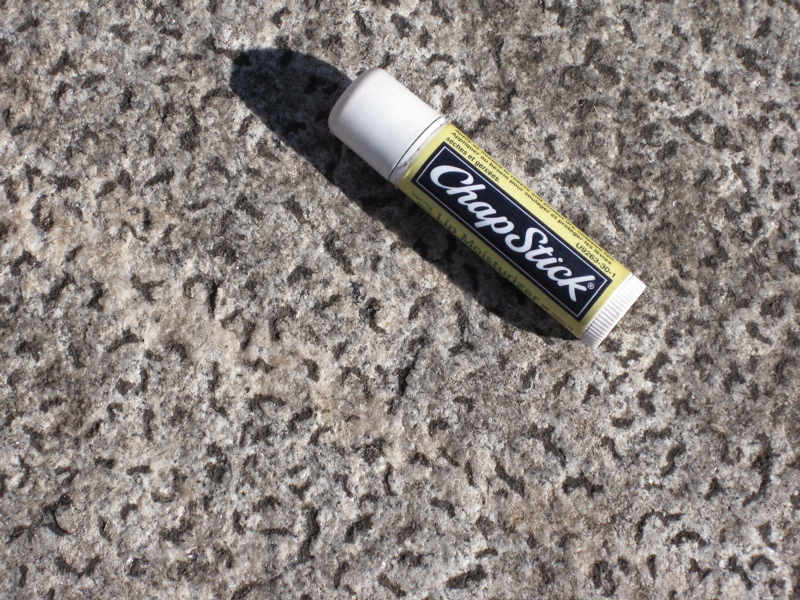 I believe that rock was pegmatitic. 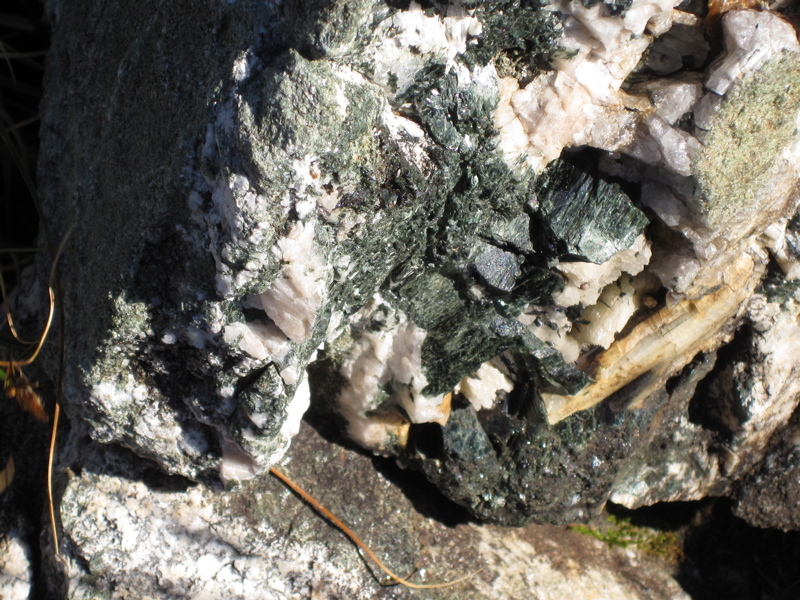 Chalcopyrite Chlorite schist Shallow-pitted surface due to faster weathering of the dark mineral (amphibole of some sort) compared to the surrounding light minerals (feldspar, maybe quartz too).